Heaven’s Best Entertainment and Quantum Films presents a romantic comedy film “English Only Please”. It is one of the eight entries on the 40th Metro Manila Film Festival (MMFF) and the only romantic comedy entry of the year. 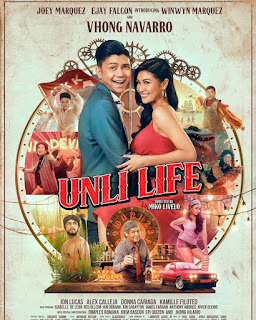 Starring are Jennylyn Mercado, Derek Ramsay, Cai Cortez, Kean Cipriano, Isabel Frial, and Lynn Ynnchausti-Cruz with special participation of Tom Rodriguez and Isabel Oli. This movie would be the first collaboration of Derek Ramsay and Jennylyn Mercado and their first rom-com film. So lets catch if there will be a strong chemistry between the two. The movie was directed by Dan Villegas. “English Only Please” plots the story of how a New Yorker falls in love with a Filipina tutor. Julian Parker (Derek Ramsay) is a New Yorker that comes from a bad break-up with a Filipina. Because of the heart break that he was undergoing, Julian wrote everything that he felt in a letter. He then decided to translate it into Filipino and he looked for a Filipino translator and there he found Tere Madlansacay (Jennylyn Mercado). Tere is a certified perky and friendly Filipino-English tutor. Jullian flies into the Philippines and learns tagalong from Tere and their tutorial will go along for 45 days. Jullian seeks his ex-girlfriend with Tere to confront his hate-filled letter in Tagalog. As they are searching for Megan (Isabel Oli), Jullian’s ex-girlfriend, Julian and Tere became friends then start to spend more time together. Little do they know the two develops a relationship of more than just friends. Will Jullian get back to his ex or will he realize that she likes Tere? Will Jullian and Tere be together? Catch “English Only Please” in cinemas near you on December 25, 2014.